Wreathes of chicken wings, bouquets of roast beef roses, puns about "meating" each other: However this wedding is celebrated, it's a great day for protein. Arby's and Buffalo Wild Wings are now one. In business terms, Arby’s Restaurant Group Inc. is buying Buffalo Wild Wings for around $2.4 billion ($2.9 billion including BW3's net debt), at $157 share, the companies announced on Tuesday. After the deal is closed, which will likely happen in the first quarter of 2018, Buffalo Wild Wings will be a privately held subsidiary of Arby's, but will still maintain its independence as a brand, which is good news for the men who bullied you in high school. 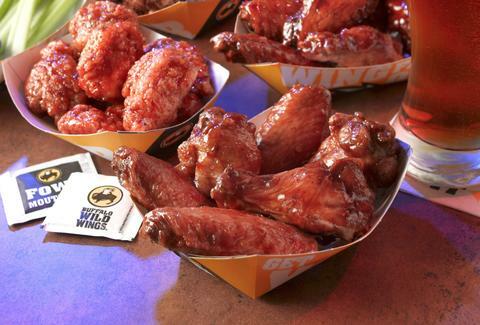 The deal still needs to be approved by BW3's shareholders, but there's no reason to expect anything other than the golden era of boneless chicken and roast beef. Paul Brown, CEO of Arby's Restaurant Group called Buffalo Wild Wings "one of the most distinctive and successful entertainment and casual dining restaurant companies in America," in a statement. But the last few years haven't been great for the Sever of Many Sauces, as restaurant goers have largely turned away from large casual-dining chains. According to Michael Halen, an analyst at Bloomberg Intelligence, the focus will probably first be on improving Buffalo Wild Wing's food and operations, which sounds like it could only be a good thing. This is the true royal wedding. James Chrisman is a News Writer at Thrillist who would appreciate a bouquet of roast beef roses. Send news tips to news@thrillist.com and follow him on Twitter @james_chrisman2.